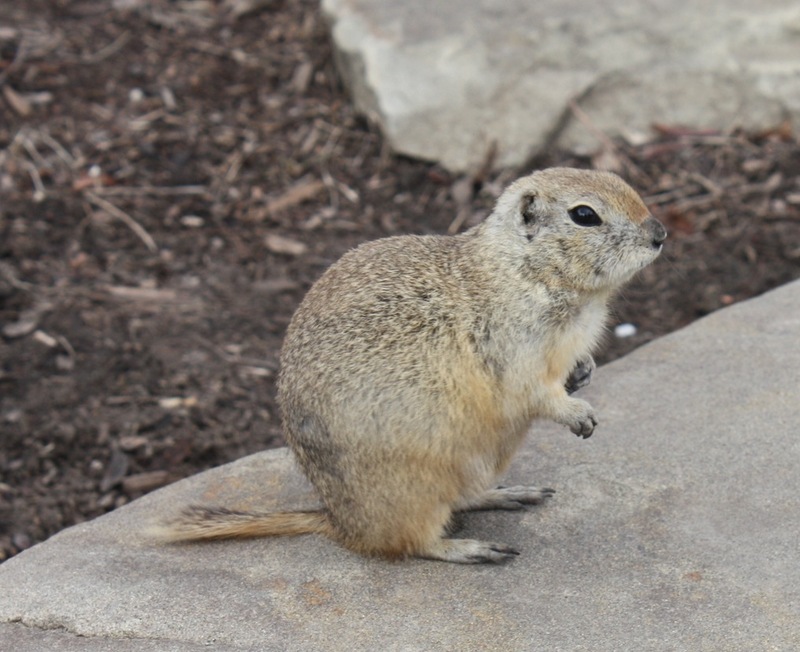 First off is the easy one, these ground squirrels infest the area around the Tyrrell and this guy was literally sat on the front steps begging for food. While I didn’t give him any, the pot belly on this one and those that were hanging around make it quite obvious that plenty of people do, though just a few yards away other locals were much more shy and sveldt. Just traces here, but quite cool that you have coyote and deer (presumably mule deer given their abundance) going in opposite directions, though of course who knows how far apart in time. 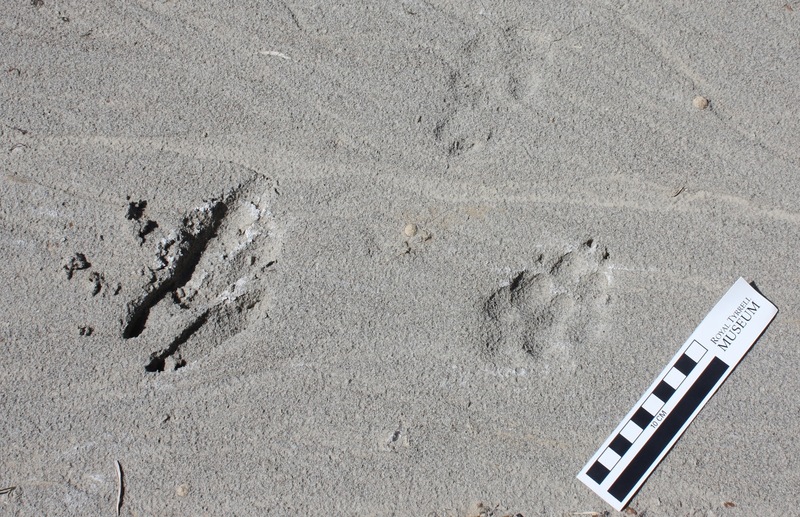 The canid also has some nice overprinting going on such that the two feet have left what appears to be one large, but rather odd, footprint. And here’s a pronghorn. A male rather obviously, and something I’d long wanted to see. I didn’t realise their range was this far north, so were a complete surprise to me when we came across a small group and I’ve got some nice photos of them mooching around. 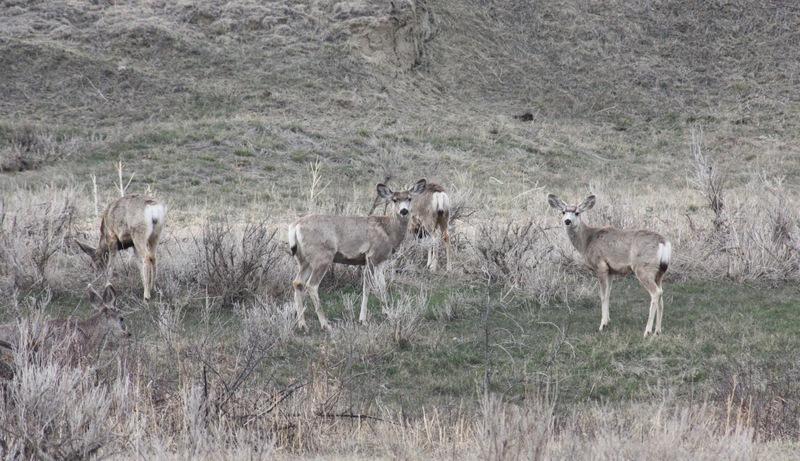 And here are some of those mule deer. This was part of a herd of a dozen or so, though there were plenty of odd ones or pairs seen from time to time in various places both around the museum and out into the wilds. I did see white-tailed deer too, but didn’t get any great photos. A real prize for me, a nice big bunny. 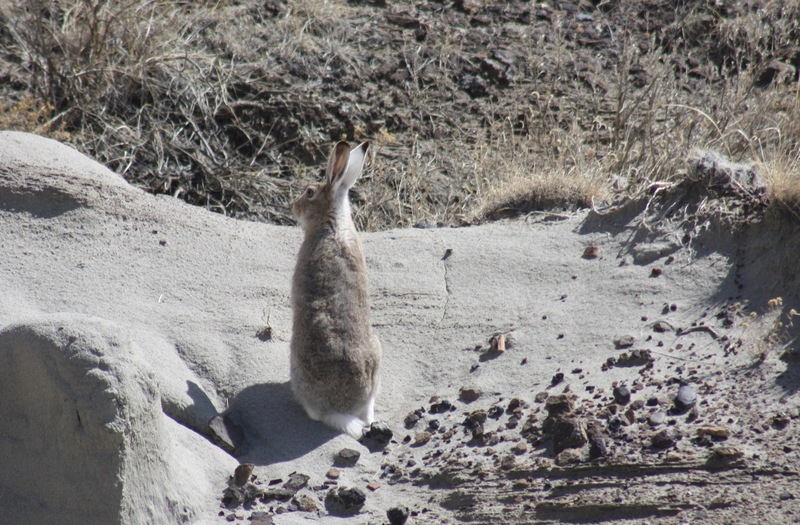 I assume this is a jackrabbit, but I don’t actually know. I really like rabbits in general and have seen desert hares a couple of times in the wilds of China, but they tend to explode out of cover and vanish over the horizon before I realise I’ve spooked one, whereas this one was kind enough to move not too fast and stop a couple of times allowing me to get decent snaps (though out of tons that are out of focus or suffering from motion blur). 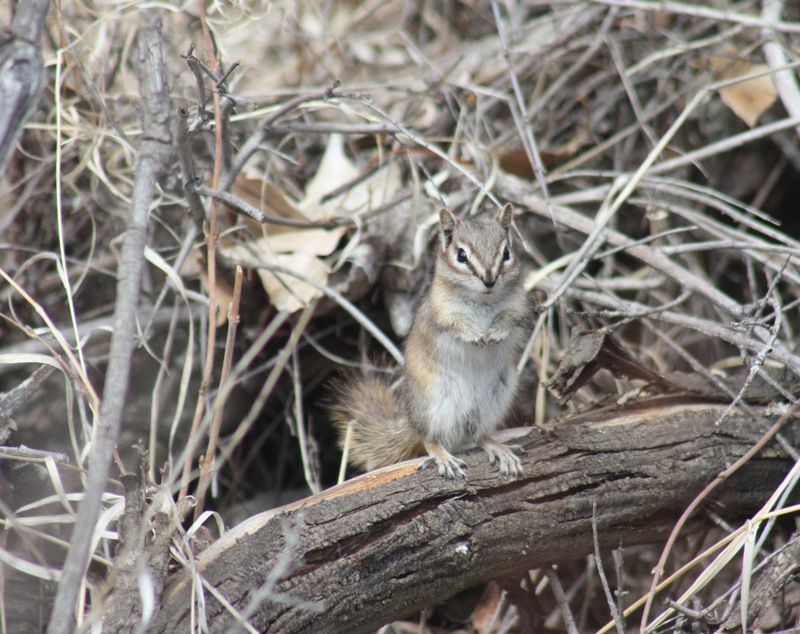 And finally a chipmunk, one of many hanging around in the woods near Don Henderson’s house, though I was also surprised to see them out in boulder fields too. I saw traces of activity from beavers and porcupines on several trees (and a couple of roadkill of the latter) but sadly no live ones were around. I think pretty much all of these bar the chipmunk were new to me, not just in the wild, but in zoos too. Perhaps as they are considered too ‘boring’ or ‘normal’ for most collections, and if the US doesn’t bother, then they’re not too likely to end up in Europe or Asia either, so this was really a pretty good haul by my standards. This place is going to be Theropod Central for a bit (until the huge volume of ceratopsians kick in), so here’s an ankylosaur to keep things ticking over. As usual, enthralled though I was with the exhibitions, I didn’t pay that much attention to the various signs or details of some of what I was looking at. As a result I don’t know all the identifications exactly and when it comes to things like these guys, well it’s hardly my best subject either. 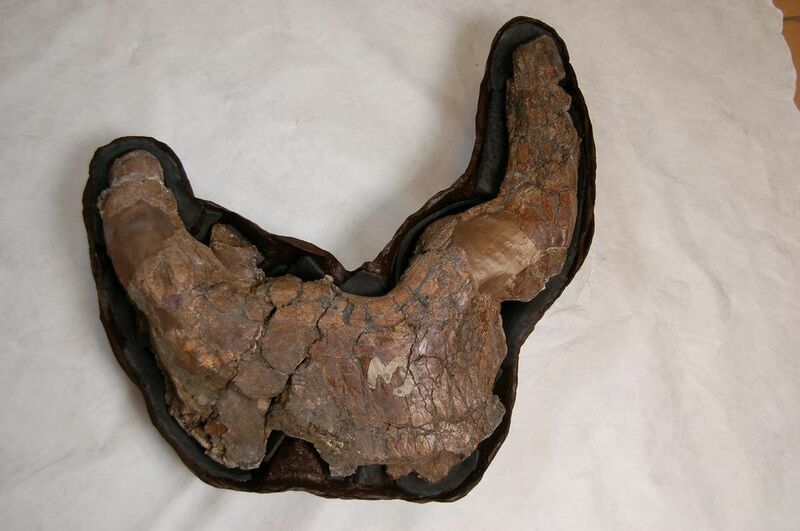 Happily however, Victoria Arbour has just published a monster paper with Phil Currie on the taxonomy and identity of North American ankylosaurs and is also furiously blogging about it. So hop on over to her blog and start reading up on them. Handily there’s guides to the various parts of the skulls and rings of armour on the neck too which will really help out here. So while I’m obviously being too lazy to look it up myself, I’ll claim I’m inspiring readers to learn how to do it themselves. Late edit: Victoria has joined in the comments to point out this is a nodosaur, and thus not in her review. D’oh. Still, go read her series anyway, it’s ace, and look at the pretty nodosaur skull (also ace). 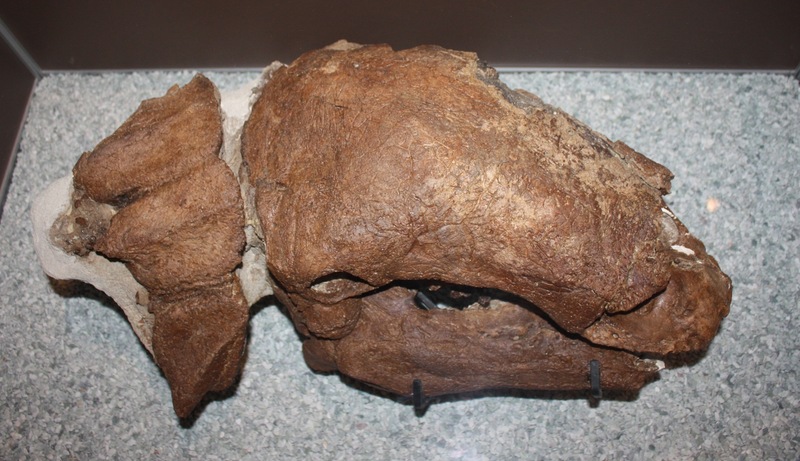 It is Edmontonia. 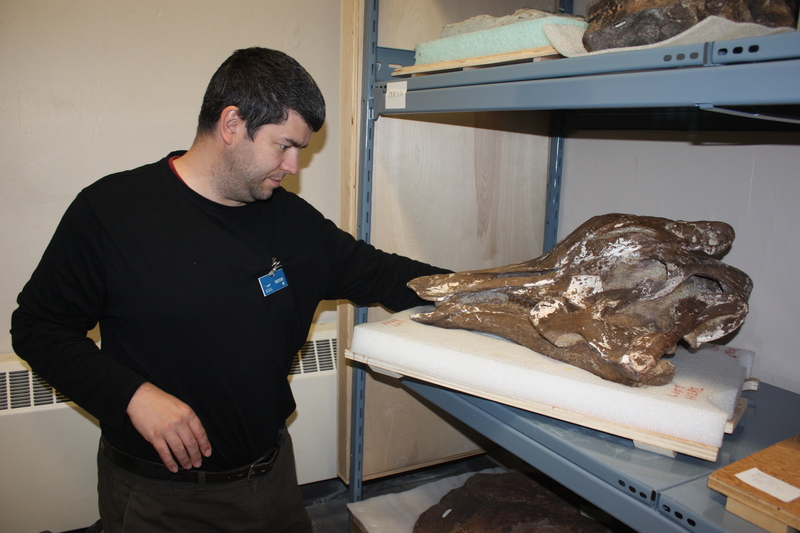 I’ve already mentioned that my time in Canada involved a short trip to Dinosaur Provincial Park with Darren Tanke, but we were also out with Mark Graham, a preparator at the Natural History Museum in London. Mark has kindly written up a guest post on the trip and the hunt for the lost Spinops quarry. The recent Fossil Preparation and Collections Symposium (FPCS) hosted by the Royal Tyrrell Museum in Drumheller, provided a great opportunity for me to give a talk about the recent conservation and mounting of a large skull of the ichthyosaur Temnodontosaurus platyodon and also to team up with Darren Tanke for some fieldwork in Dinosaur Provincial Park to try and find the location of a lost quarry. The quarry we sought had contained, in 1916, a bonebed of material which the legendary Sternbergs had collected for the then Geological Museum in London (now the NHM). 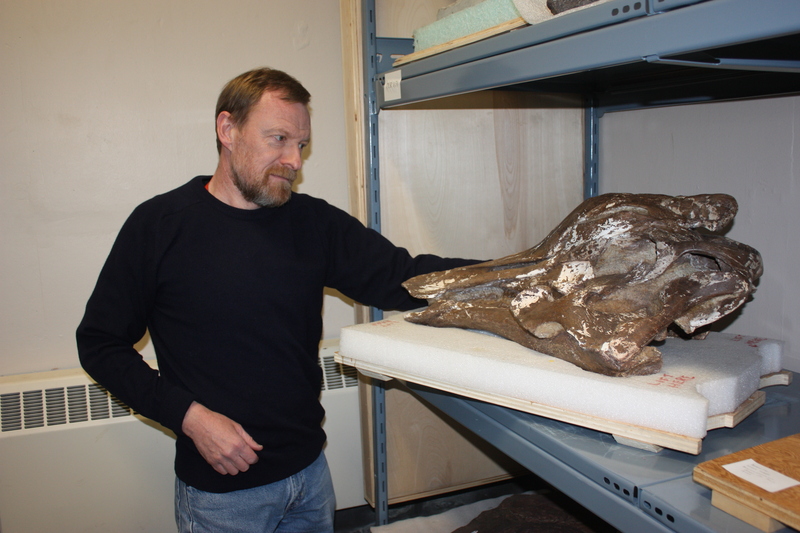 Among the specimens collected was the partial skull and parietal elements of a horned dinosaur – a centrosaurine ceratopsian – which I had the privilege of preparing in 2008. It was a new species named Spinops sternbergorum and it was through this work that I got to know Darren (we were co-authors on the descriptive paper). He suggested that I take along a sample of the Spinops matrix so that we could use it to try and match the distinctive ironstone to exposures in an area “3 miles upriver from Steveville”, which the Sternbergs had recorded as the location of the find in their field notes. Locating abandoned quarries in the badlands from clues left in old photographs, fieldnotes, quarry markers and litter is something of a speciality of Darren’s and so I tagged on three days holiday at the end of the symposium to do some sleuthing with him. Dave Hone was also at the Tyrrell, undertaking research with Darren into bite marks on fossil bones and he also attended the symposium and gave a very insightful presentation titled ‘Scientific Communication of Fossil Preparation in the Digital Realm’ [Dave adds: this should go online at some point]. 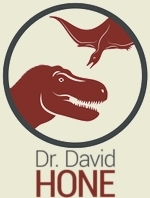 This discussed how his blog had been used to communicate Darren’s prepwork on the tyrannosaurine Gorgosaurus to a wide audience of professionals and amateurs. Following the symposium, Dave joined in the expedition in search of the Spinops quarry. First, we hired a small room in a ‘Hotel and BBQ Pit’ in a little place called Patricia, a few miles outside Dinosaur Provincial Park. It is an old haunt of Canadian palaeontologists and the accommodation could best be described as offering ‘substantial scope for improvement’. I experienced for the first time in many many years the joys of an upper bunk bed! But it all added to the fun and, as the name suggested, in the evening guests get to cook their own steaks, burgers and chicken on a big indoor barbeque. We were all up early the following morning and after a hot breakfast we set off for the field with pack lunches and plenty of water as the weather, which had been cold with snow flurries, had turned quite warm and windy. Darren had arranged access with a land owner and we drove across the prairie in search of a padlocked fence that we had been given the combination to. The terrain was incredibly flat and featureless but thanks to Darren’s knowledge and a bit of help from the GPS, we found our way. En-route we saw some great wildfowl and white tailed deer which gave Dave an opportunity to get busy with his telephoto lens. Soon enough we reached a point where the prairie fell suddenly away into coulees and down into the Red Deer River Valley with the great bluffs of the Upper Cretaceous rising all around. 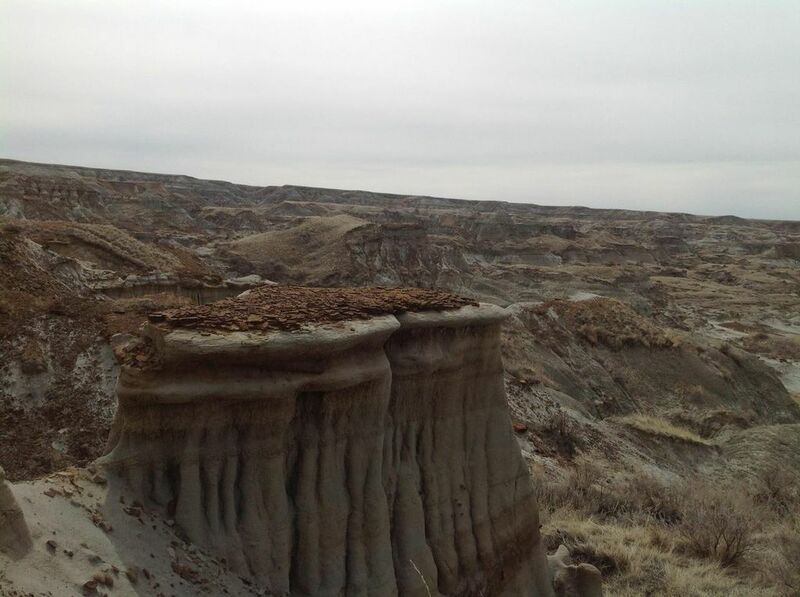 This landscape was formed after glaciers scraped away great swathes of land during the last ice age 13,000 years ago and has been steadily eroding ever since, creating some wonderful capped pinnacles called hoodoos, where ironstone rich layers weather out atop columns of softer sandstone rocks, like giant mushrooms. The scene looked exactly like the old photos from the golden age of fossil hunting and we began working our way down the steep sides of the bluffs, stopping on platforms as we descended and jumping across the occasional water eroded crevice onto the next slope. Many of the surfaces were very slippery with weathered Bentonite clay shale, which mercifully was fairly dry. When wet the shale is treacherous and impossible to get a firm footing on. Mark in the field. The area was cleared of cactus first. Darren had warned us against nasty little cactuses which grew a few centimetres high and that left lots of needles in the hand if touched. It didn’t take me long to reach up for support climbing over a ledge and put my hand onto one, which resulted in some choice language. My right hand resembled a pin cushion and it took a while to remove the spines. Some of the broken ones stayed put and are still working their way out weeks later. But we soon all started finding material – dinosaur, champsosaur and turtle was everywhere we looked, weathering out of the rocks all around us. Hadrosaur and ceratopsian bones are commonplace and during our prospecting our finds included a row of articulated hadrosaur vertebrae, complete limb elements, a virtually intact ceratopsian vertebrae hanging off the edge of a slope, a perfect ankylosaur tooth and two large tyrannosaur teeth. We also found part of a hadrosaur limb with fantastic serration scars from predation. 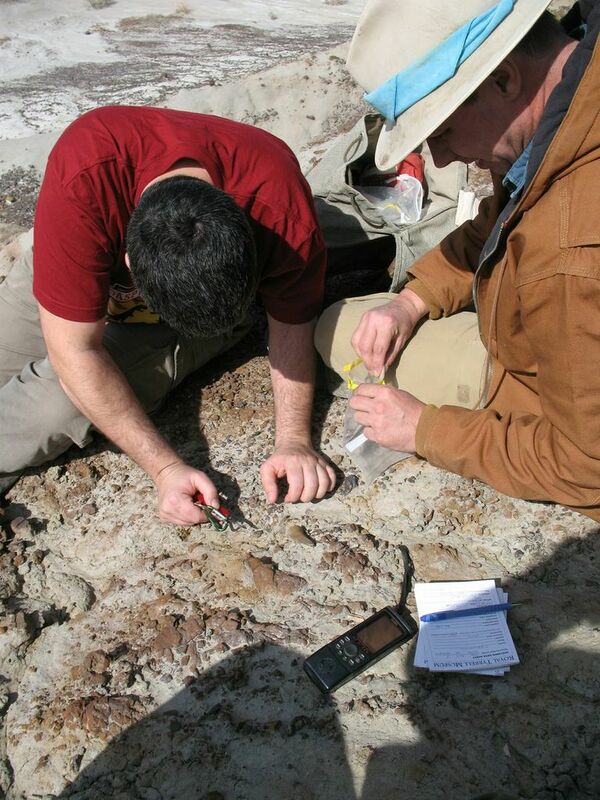 One area which demanded our attention was a steep slope at the bottom of which we were finding fragments of tyrannosaur bone and all three of us turned up several broken fragments across an area of a few feet, suggesting that a specimen was – or had been – weathering out. Under the provisions of the Alberta Historical Resources Act of 1978 all palaeotological, prehistoric and historic resources are protected on both crown and private lands. The DPP is a world heritage site and the law protecting its fossils is unambiguous – nothing may be removed. Darren used a GPS to pinpoint our more significant finds and, because he represents the Royal Tyrrell, we were able to carefully remove, tag and bag the tyrannosaur teeth (which could be used in the museum’s excellent educational programme) and the predated specimen, which had an immediate research application. This material and the accompanying data were logged back at the museum. It was very satisfying for Dave and I to record our names on the specimen find tags alongside Darren, knowing that these would be associated with the specimens in the museum collections. 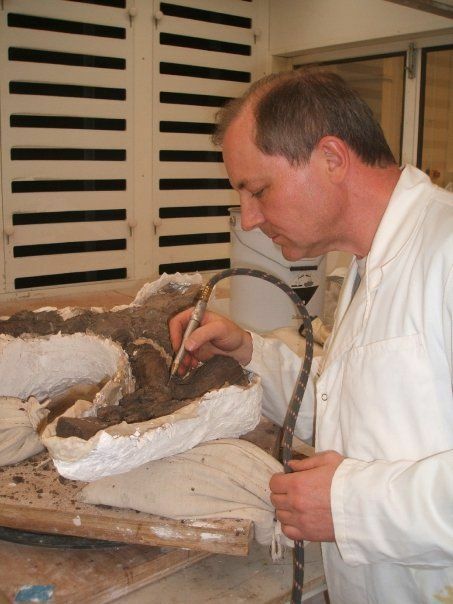 While no professional palaeontologist would argue against the need to protect fossils and guard against illegal collecting, it seemed very alien to leave behind really well preserved specimens to deteriorate in – and ultimately be lost to – the elements. 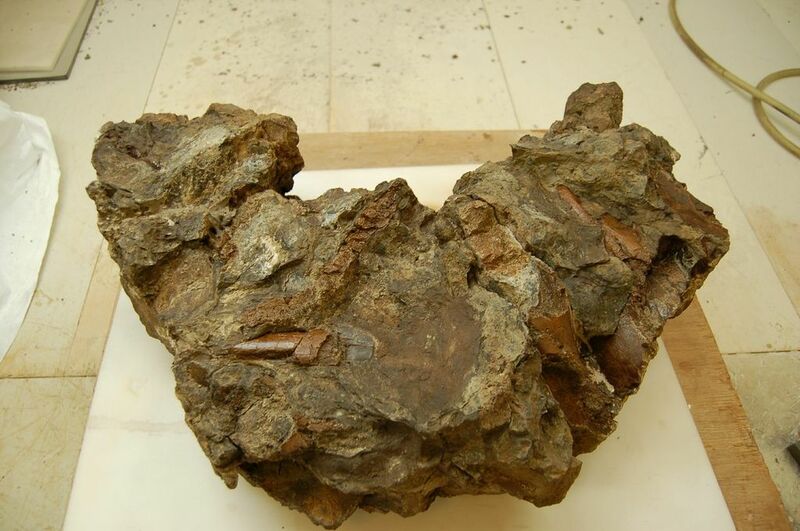 I couldn’t help thinking that, surely fossils like the perfect little ankylosaur tooth, the intact limb bones and phalanxes and unguals and the string of vertebrae could be loaned to schools and colleges in the province and beyond to inspire students to study palaeontology; serving an important purpose and protecting the material for future generations?. While the scientific value of much of the isolated elements is limited, it could nevertheless spark passion in budding palaeontologists and who can argue that that is not in itself of scientific value? We scoured a long stretch of the coulees – up and down each one – parallel to the river in the vicinity Darren had identified from the Sternberg field notes, paying particular attention to the boundary of the Dinosaur Park and Oldman formations. Dave found some rock closely matching the matrix sample but there was no sign of quarrying at that spot. On the second day, Darren found a metal quarry marker which he recorded on the GPS for further investigation, but he didn’t think it related to the missing quarry and he is now turning his attention (following some further intriguing clues)to the possibility that it might be located on the opposite side of the riverbank. Spinops parietal frill: sadly still quarry-less. 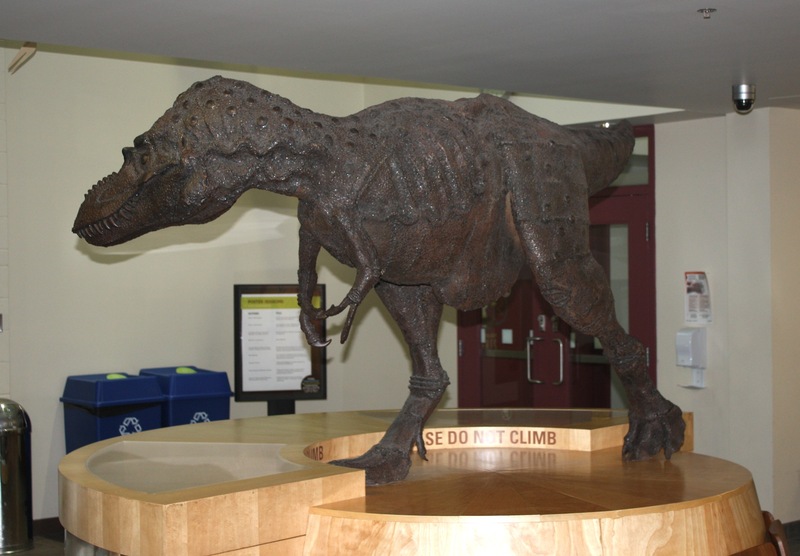 My visit to the Royal Tyrrell collections, the symposium and the field trip were fantastic and I’d like to record my thanks to the organisers who did a fabulous job. In particular I know that Dave will join me in marking our appreciation to Darren, who spent a great deal of time with us even though he had other pressing demands, including his father’s hospitalization and a house purchase to deal with while we were with him. As you might have already guessed, the Tyrrell is not short of tyrannosaurs and this blog is going to be heaving with them by the end. I mean, this is the second post and I’m still on all the life reconstructions! (and no, we’ve not got to the murals yet, let alone the actual mounts and specimens). First off is this great rendering which stands outside at the main entrance, and it’s one I really like and probably prefer to the set I covered in the last post. The pose is really cool and a colours are great (though perhaps a bit faded in the sun), but it really is a great way to welcome people to the museum and stands atop the Tyrrell logo which is, well, you guessed. The second one is not easy to see as it’s in the education centre and so not always visible to the average visitor, which is a shame as it is absolutely great. It looks like a bronze statue from a distance, but in fact appears to be made of metal plates welded together, with the details picked out with blobs of metal that I assume were welded or soldered on. It’s mounted on a plinth with seats built into one side, and a glass case containing a partial skull on the other. While it’s a shame not everyone gets to see these, I’m sure it’s a real thrill for the kids that they get to see some bonus stuff the adults can’t and it’s a superb sculpt. I’m not sure I’ve ever seen anything quite like it, and welding can’t be the easiest medium, yet the result is brilliant. Coming next? Oh, I don’t know. I still have several hundred images to sort through and much exam marking to complete. I’m sure I can find something exciting though. Probably with tyrannosaurs, whether I intend to or not. And so to the Tyrrell. Well, there’s really quite a lot to come here, from the setting of the buildings, the collections and of course the galleries. As with the Carnegie, it’s going to take quite some time, and so I really do hope people don’t get sick of it, but well, for those who have never been and may never go, I’m sure it’ll be something of a delight, and even those who know the museum well, I hope I can add some new thoughts. 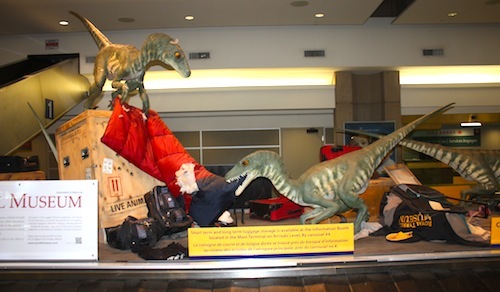 Although there are life reconstructions outside the museum and various details of the building and so on, I’d though I’d begin with what is effectively the start of the museum and the entrance hall which contains four life sized reconstructions of various Albertan tyrannosaurines. They are certainly impressive, and rather appropriate, and the setting is rather well done, though I have to be picky and point that they all have rather odd heads, and given that these are (as far as I could tell) supposed to represent two or three different species, the fact that they are all the same colour and pattern is rather a disappointment. Nitpicking aside, they really do dominate the room and are beautifully made. Everyone I saw who entered stopped to have a good look and the effect on the kids was obviously superb. 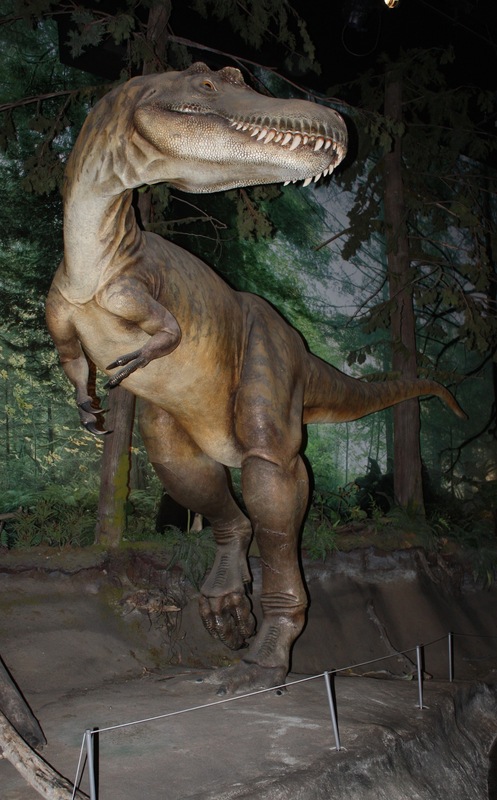 They do have problems, but as an introduction to a dinosaur museum, I thought they were superb. While looking through Don Henderson’ personal collection, I stumbled across this picture of my (and indeed Don’s) PhD supervisor, Mike Benton. 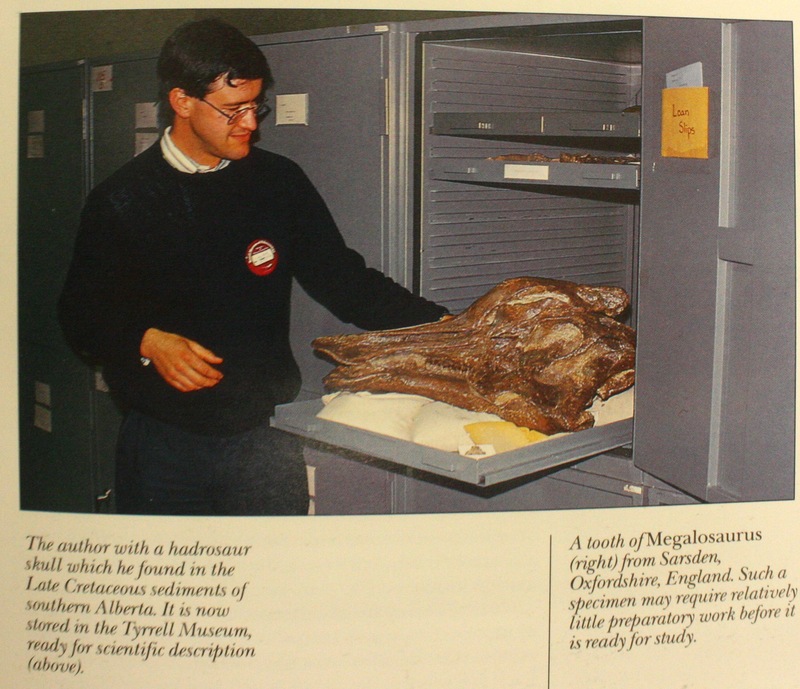 It’s from a book of Mike’s (On the trail of the dinosaurs) from 1985 and shows him with a hadrosaur skull he found while in Alberta. Don spotted immediately that it was a specimen in the Tyrrell collections, and indeed the cabinets are a bit of a give away too. In a moment of inspiration, Don suggested that as academic descendents of Mike, we could redo the photo with the specimen as it is now. A quick hunt in the collections turned up the skull, but it’s now in their special protected room and not on the normal shelves. As a result the background and position are of course imperfect, but we did our best with the available materials. Note that both Mike and I have different generation Tyrrell guest badges too which rather nicely links the two eras as well. Just a bit of fun really, but this could be a great meme for those researchers who want to celebrate their mentors and supervisors. Go and recreate their famous appearances with discoveries or research photos. 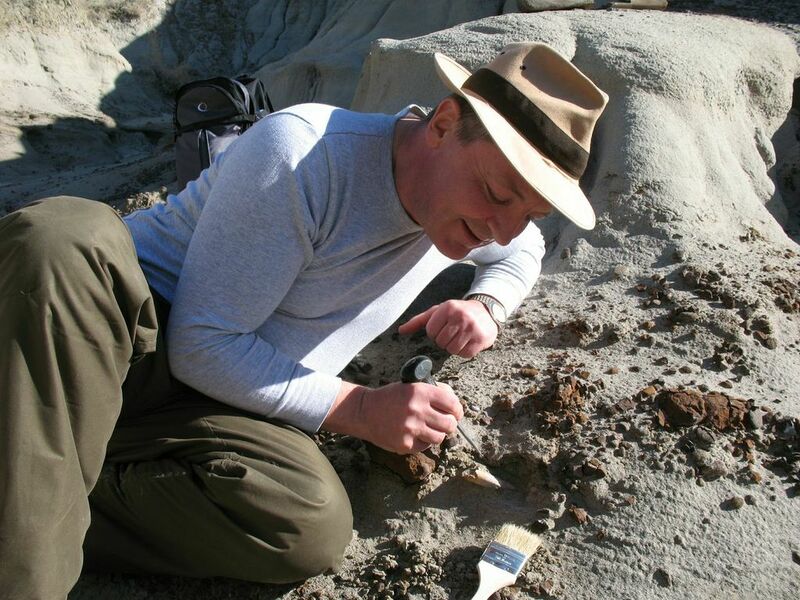 And while I’m on the subject, Don has penned this lovely little piece on the superb Alberta ankylosaur that some will have seen presented at SVPCA a could of years back. Enjoy. So a last look at some of what is on show in the new Berlin halls. 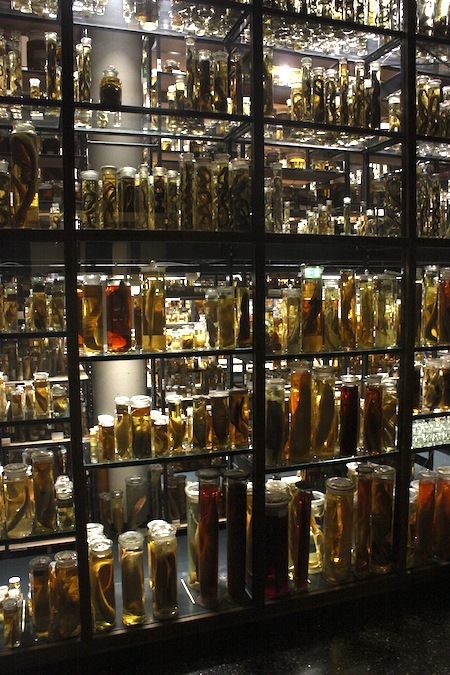 These are a couple of shots of their new spirit room, a climate-controlled room to protect all of the various pickled specimens in jar upon glass jar that line the shelves. 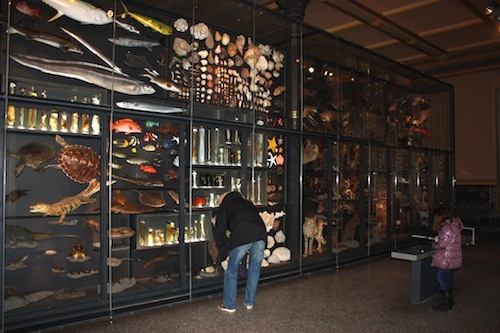 The Natural History Museum in London have also relatively recently renovated their spirit collection and moved it to not just a better environment for the material, but also opened it up to the public in a similar manner and the effect in both cases is superb. 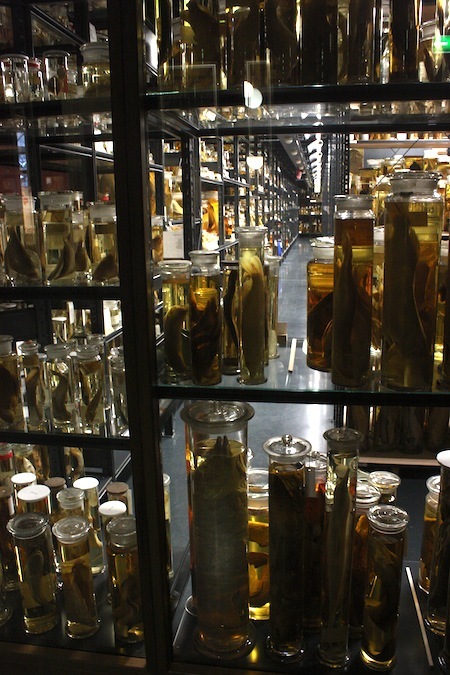 These are parts of collections rarely seen by visitors to museums and they are difficult to display and are probably seen as something of a turn-off since it does tend to be lots of very bleached and slightly decayed bodies crammed unceremoniously into jars, and it’s often pretty tricky to tell what’s in there. However in both cases I think the point is less about exactly what is there, and more the “look at all this stuff” effect of the whole collection. You are there to see the forest, not the trees, and so it’s a demonstration of just what material and information is there and what this means for both the museum collections and science as a whole. When that is offset by the aesthetics of all that glass in a glass-fronted room and clever lighting, the effect is quite wonderful. I started looking through the huge collection of photos from the Tyrrell and realised that I’d never finished covering all of the Berlin Museum that I started back at the end of Jan. I really don’t want to leave that hanging on till after we’ve trawled through huge amounts of the Tyrrell, so it’s time to try and polish them off. I had planned to spin these out a bit, but with plenty more pressing, I’ll have to keep it down. If you want more, I guess you’ll just have to go and visit. 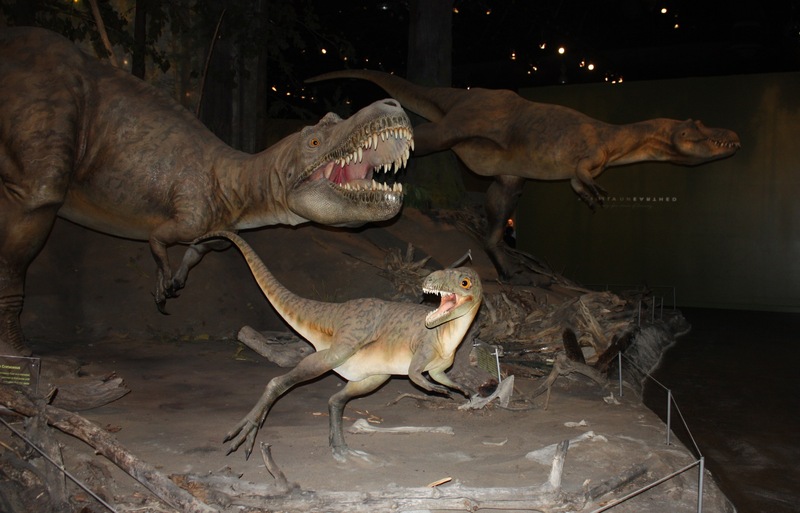 Much of the museum has been renovated and updated in relatively recent years and this was my first visit since the big update of the dinosaur hall in 2007. 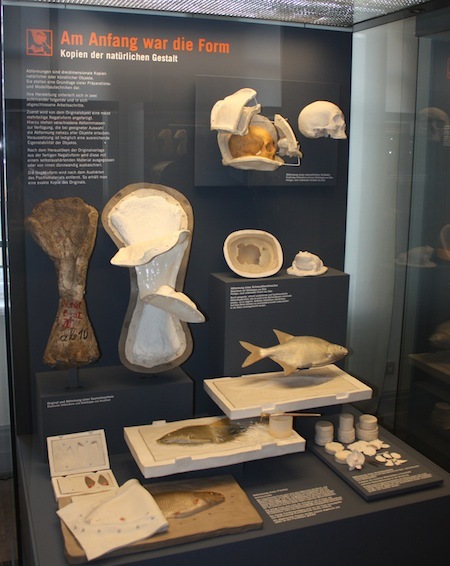 There are some lovely new displays and cabinets and in particular, some great little pieces that demonstrate key features of biology or evolution. Above we have a diversity wall, an increasingly common introduction to biology halls, something like this is present in many museums. Still, it is wonderfully done and well-lit and there is a lot to take in. This case is a great one about convergence, but sadly was hard to photograph so doesn’t really show it off well. As you can see, there’s a variety of aquatic vertebrates here, both extant and extinct, and the text explains the convergences in form of both body shape and fins / flippers etc. 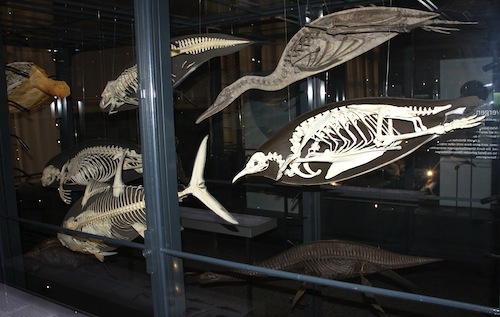 Each skeleton is apparently backed in black, but the other side shows the ‘fleshed’ out forms, with taxidermy skins for the extant animals, and well-made models for the extinct ones. 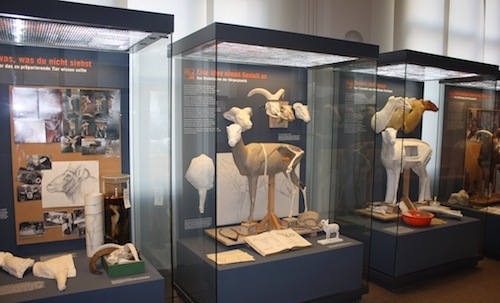 And on the subject of taxidermy, here’s a great series of displays on the construction of museum-quality exhibits, covering all the issues of drawings, sculpture, skin preparation and the rest. While many places discuss casting and mounting skeletons, model making and the like, I can’t think of another set-up I’ve seen covering this aspect of curation. 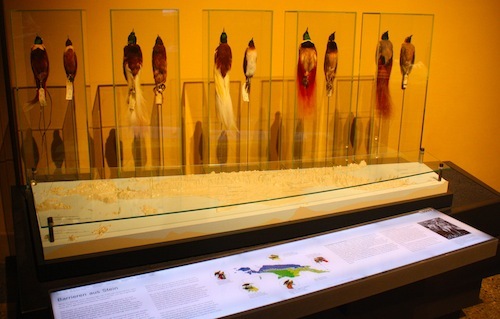 I suspect the reason may be a bit of anticipated squeamishness on behalf of the public, museums won’t want to draw attention to the killing and skinning of animals, even if it was done decades, even centuries ago, but it shouldn’t be ignored and this is a hell of a skill and should be celebrated. 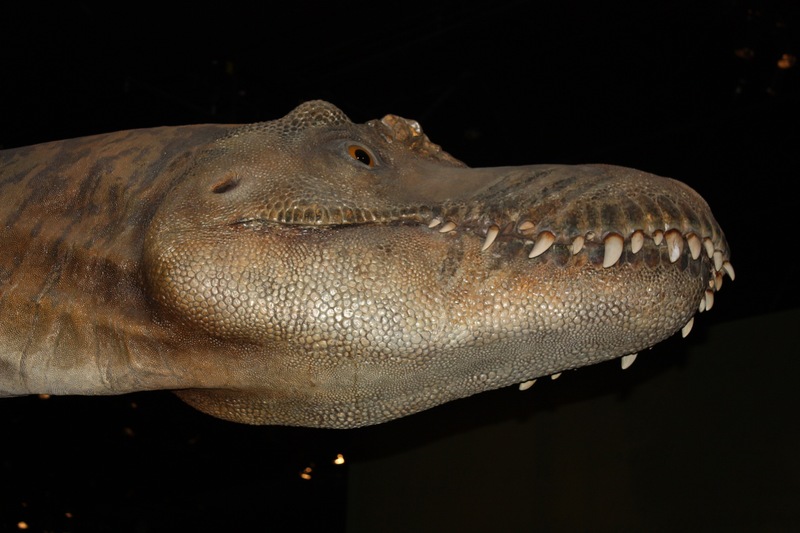 Though here is that almost inevitable (but again, very well done) case on casting and replicating materials, and for once not just dinosaur bones but other hard pieces and even a mounted fish. Again, clearly laid out, but concise, and well thought out. This one was really impressive: so simple and so effective. We have a nice relief map of New Guinea, with various skins of birds of paradise laid out, and then a map to show how the different barriers (mountains etc.) have led to reproductive isolation and the development of the different species and subspecies. It ties together wonderfully easily and it’s quite clear how they are all similar, but still different. A wonderful example of biogeography and evolution and presented very simply and clearly. And finally yes, some fossils. 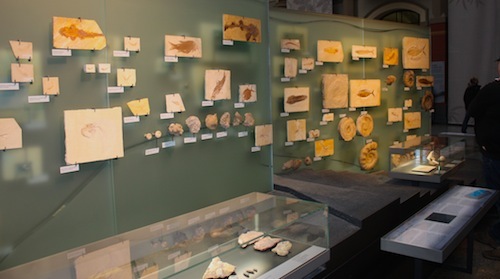 This is part of the Solnhofen display and does a nice job of showing off a lot of material, but without it being too crowded. It gets across the real diversity of species there and indeed the different modes of preservation (there’s some 3D bits in there). Overall, the new material is really pretty good. There are some niggles and inevitably compromises, but there’s an awful lot of material to see and it’s well displayed. While I do really like exhibits and cabinets that show off the mechanics of museums as it were, these are especially good here and there’s a lot to be gained from them, and in particular how compact many of them are. 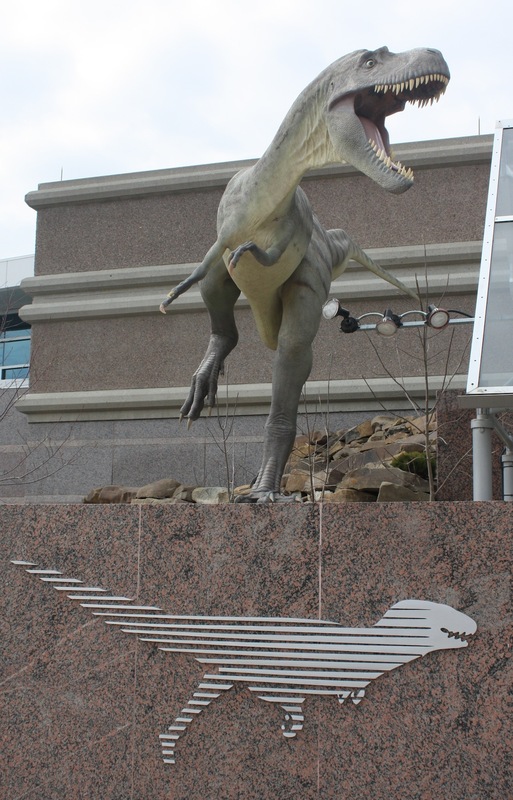 And of course, really quite a few big dinosaurs as well. 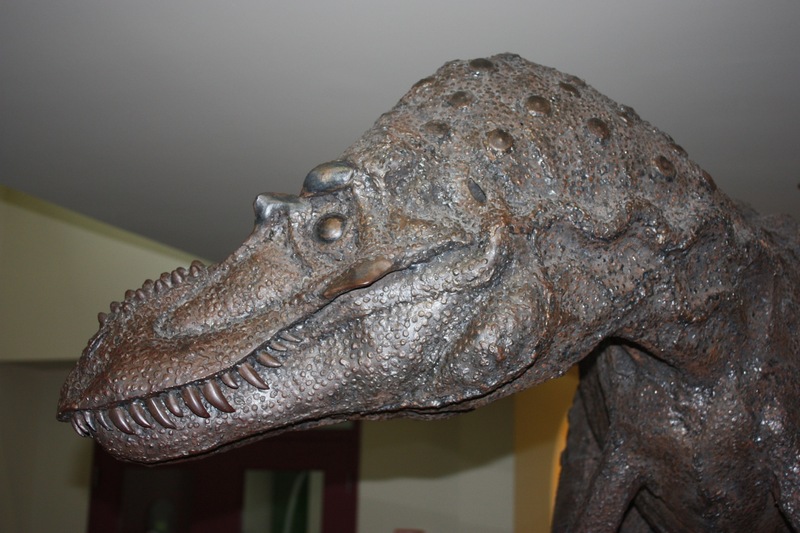 Well I’m back from my trip to the Tyrrell to do the research part of Project Daspletosaurus. I’ve had a great time and been extremely busy, but in addition, barely had any internet access or there would have been more blog posts. 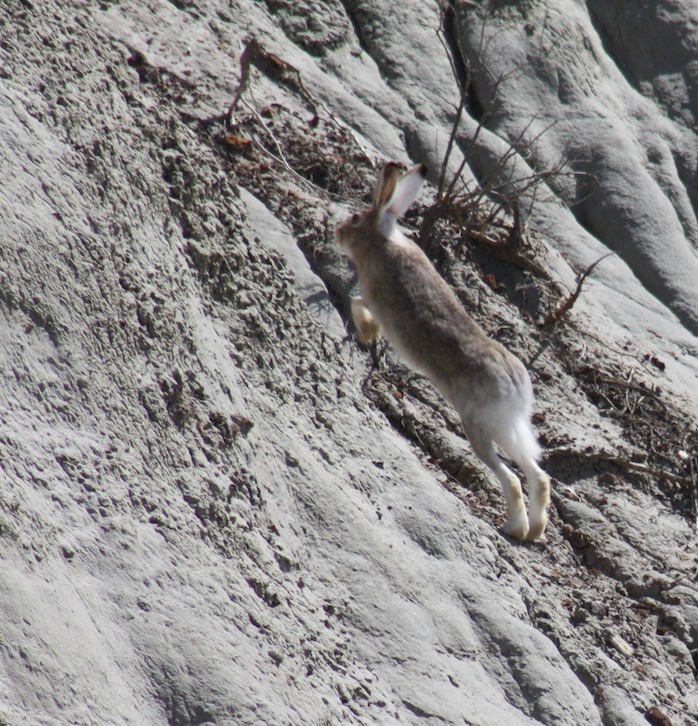 Now I have to claw my way through mountains of built up e-mails, reviews and exam marking, but I have also returned with several thousand photos of the museum, Dinosaur Provincial Park, Calgary Zoo and others, so there will be plenty to come sooner or later. 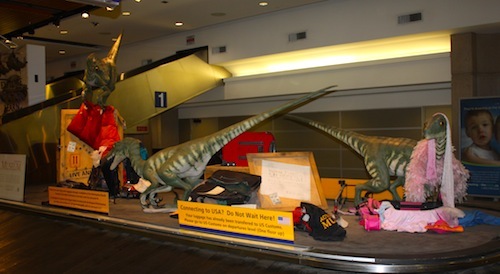 These were my first photos in Canada however, with this fun set-up on an old luggage carousel. Before people complain too much, the sign does explicitly say the models are old and discusses feathers. It’s still rather fun though and as it links to the airport, seemed a worthy contribution to the post. More to come, but it might be a few days before I have the time, motivation and lack of jet-lag.